You’re in the market for stylish outdoor furniture, but the high end brands’ price tags give you a cold shiver down the back? Here are a couple of ideas of where to find the best outdoor furniture for your money. There are a bunch of popular Canadian retailers of patio furniture that have great offers on outdoor furniture. Stores like Canadian Tire, DOT Patio Furniture, Lowes Canada and Costco are well known for their home products and also carry patio furniture. While not all of them have huge collections, they all offer some interesting pieces that help you create the perfect outdoor living space. While the quality is not always top priority, they all offer great value for outdoor furniture and this is the reason why a lot of consumers prefer these retailers. Canadian Tire has some trendy patio furniture and patio accessories. 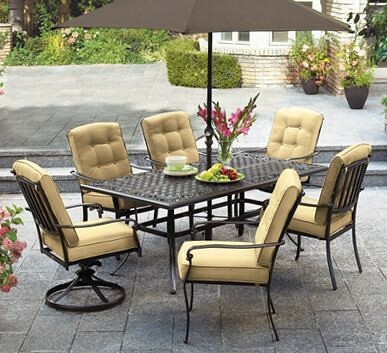 For example, this lovely Camden Patio Furniture Collection can serve as the central point of your outdoor patio area. Pick and choose with this wrought iron style dining set. DOT Patio is another popular retailer that provides lots of patio furniture and patio accessories. The Maribel resin wicker daybed adds a romantic ambiance to your outdoor living space besides adding comfort. This elegant wicker daybed provides enough space for two and the canopy attached to the bed provides protection from the sun. The canopy can also be folded down if not required. The daybed comes also with a comfortable cushion along with five throw pillows. Moreover, the matching ottoman provides your patio with a complete lounging experience. 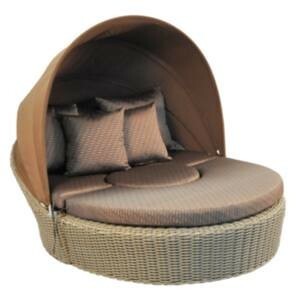 This all-weather resin wicker daybed not only looks elegant but it is also very durable and available at attractive price. Lowes is relatively new to Canada and constantly extends its product portfolio. They also provide a small variety of patio furniture to add value to your patio area. 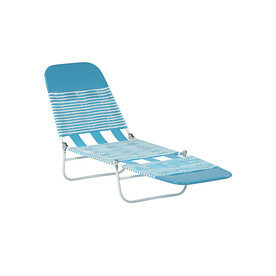 This retro Banana Steel Patio Chaise Lounge by Lowes Canada can be a useful addition to your outdoor living space. The chaise lounge is ideal for spending a lazy afternoon in a relaxed way. It is strong and long-lasting, made of durable PVC tube and a powder coated steel frame. Costco has been a save bet for Canadians for all kinds of grocery and home products. 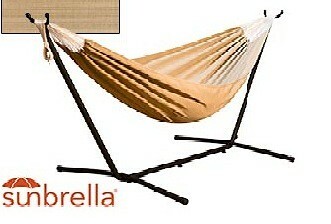 They also offer a respectable line of durable outdoor furniture, mostly sold exclusively online. This hammock by Costco is made from high-quality and weather-resistant fabric that provides you with long-term durability. It can easily accommodate two adults. Also comes with a polyester carrying bag. Similar to Costco, Beliani Furnitures has chosen the web as their primary sales channel. Their products are strong builds, usually made from aluminum frames and all-weather wicker. They are gaining a strong position within outlet stores for patio furniture. The innovative modern designs makes Beliani stand out amongst other patio retailers. 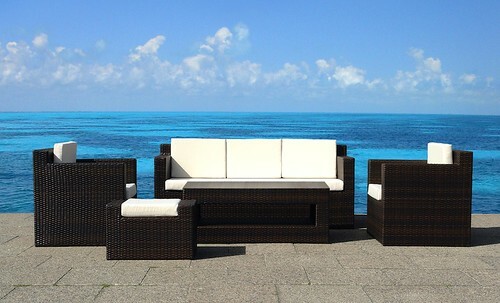 The Roma below is a durable resin wicker conversation set. Find more outlet stores for patio furniture. best outdoor furnituremodern garden furnitureoutdoor furniturePatio furniture. Previous Post6 Ideas for Designing the Outdoor Patio SpaceNext PostWhat Materials Should I be Looking for in Outdoor Furniture?